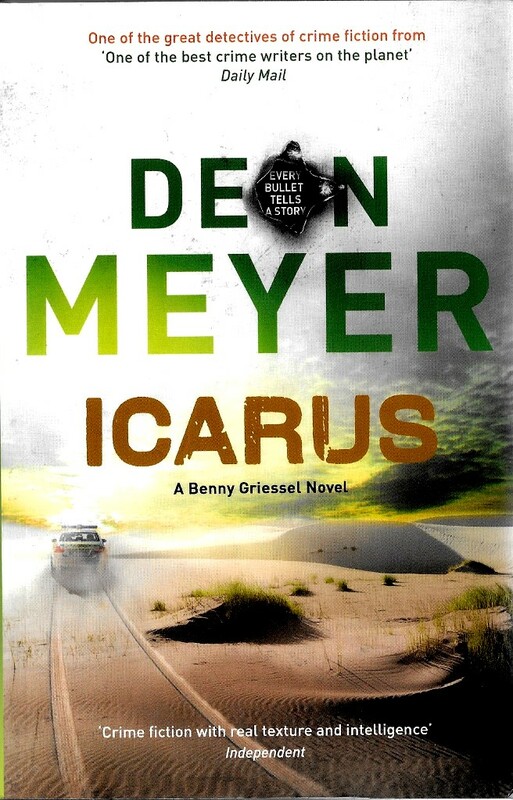 I’ve just finished Deon Meyer’s excellent novel Icarus. Now the fact that this book is about a group of policemen trying to figure out who killed a man in Cape Town means that it will be categorised as a crime novel. If it is to be so categorised, then it should be classified as a superior crime novel. In Icarus, the protagonist is the troubled Benny Griessel, whose problems with alcohol affect both his working and social life. There are many troubled detectives around e.g. Ian Rankin’s Rebus, but Meyer’s detailed characterisation is well beyond the scope of most crime novelists. The author also presents, in a subtle fashion, South African society with its many racial and economic stresses. We also get an intriguing picture of different areas of Cape Town and the surrounding wine areas. The plot revolves around the murder of Ernst Richter, an entrepreneur who has set up a business which provides alibis for errant husbands (mainly) and wives. On the face of it, the company is very successful although we slowly come to see that this is not the case. Meyer maintains an excellent pace, with careful plotting and, like many other crime novelists, he does not lose his nerve at the end of the novel and go for a melodramatic conclusion. There is an unexpected twist right at the end of the book which is hard to see coming, and the reader is led up quite a few garden paths by the author. There is also humour in the book and some interesting detail on the development of the South African wine trade, as well as the more usual strains between different police departments. I will certainly return to this author and I encourage you to try out one of his books. I am gradually getting back to some kind of bike fitness, mainly through a series of rides up the hills near Dunbar. We’ve had an easterly air flow – thanks to the Jet Stream unfortunately getting stuck to the west of the UK – for about 4 weeks now. So I have been heading east – I always go against the wind at the start of my bike ride – on a 24 mile (39K) route which takes in a fair few hills. The route takes me on a countryside route to Cockburnspath (good photos) and up the hill to the turning which takes you on to the Abbey St Bathans (good photos) road. If you continue on this road, then there are some serious hills on the way to and from Abbey St Bathans, but I turn off on the undulating road leading to Oldhamstocks, where I usually stop for a drink and a liquorice or treacle toffee. I returned there yesterday with my proper camera, as the mobile camera was not effective on my bike ride. 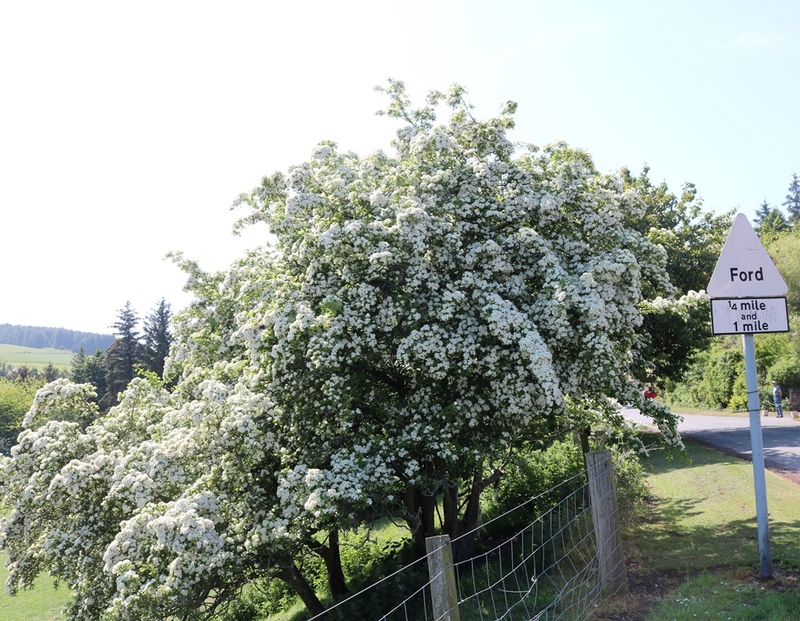 One of the features of the countryside around Dunbar at the moment is the hawthorn blossom which is also known as May blossom. The Scots equivalent of the phrase “Ne’er cast a clout till May is out” is “Ne’er cast a cloot till May is oot”. The meaning of this saying is that you should not discard any winter clothes until the May blossom appears i.e. not until the month of May ends. Due to the cold Spring we had here, the hawthorn blossom has not emerged in full until June this year, but what a show it now provides on countryside hedgerows and trees. In the first photo below, the cascading white blossoms can be seen and they are enhanced by the sun. 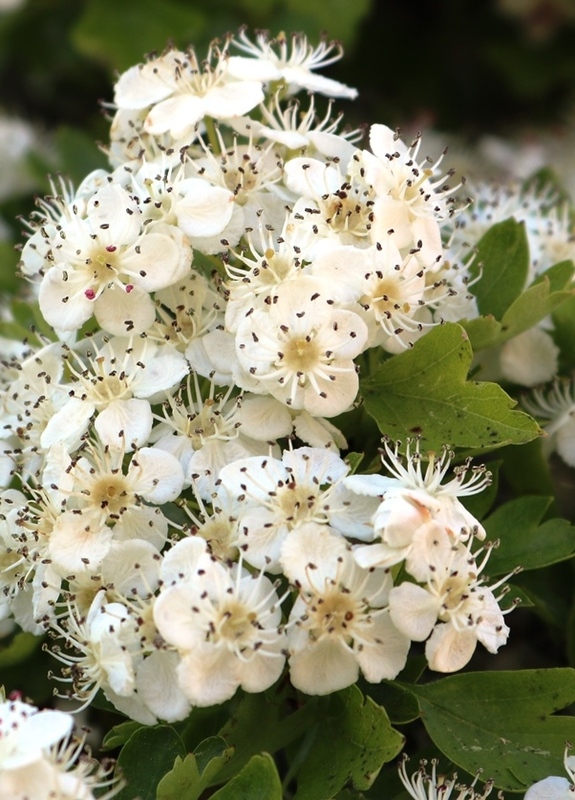 The blossom totally transforms the tree from what one journalist wrote “In winter it [hawthorn bush] is a dour barrier of bare thorns”, into “the creamy curds of May blossom”. There is a deliciousness about the look of the tree, as if it had been decorated with tiny balls of ice cream and dusted with icing sugar. On closer inspection – in the photo below – you can see the individual flowers that contribute to this mass display, with their delicate petals and thin stamens reaching out to capture the sun and attract the insects. It reminded me of something divers see on coral reefs and you can imagine the hawthorn flowers dancing with the flow of the water on the seabed. This stop – and it is a bus stop also – is also interesting for the signposts in the photo below. No metrication here – I had cycled two and half miles from Cockburnspath, which is known locally as Co’path and is pronounced Co-burnspath. Below this, it should read Duns (good photos), an attractive border town which is 12 very hilly miles away. To the right, one mile ahead is Stottencleugh – cleugh is pronounced clue – ch (as in German Ich). In Scots, a cleugh is a narrow gorge and there is one near the farm of Stottencleugh. Below Stottencleugh, Cocklaw is signposted as one and a half miles away and it is a farm at the bottom of a very steep hill. This is a popular walking area (good photos). The larger signpost below points to Woollands ,which is a farmhouse set in extensive grounds on a hill and has magnificent views. After my stop, I followed the sign pointing up the big hill towards Innerwick and its normally hidden castle ruin. There is one last steep, winding hill you need to get up – to The Brunt farmhouse and steading and from there it’s downhill and back to Dunbar.